delaying reproductive development (Castro et al., 2009). This results from a decrease in the amount of photosynthetic machinery, a downregulation of photosynthetic activity and, through interactions with other environmental factors, particularly temperature and water availability (Moore et al., 1999) and in some species an accelerated overall life cycle which mitigates against any extension of the vegetative phase (Miller et al., 1997). The major concerns for crop productivity as a result of increased levels of greenhouse gases are related to warmer temperatures and altered amounts and patterns of rainfall. Both average temperature and temperature variability are predicted to increase. Average global temperatures are predicted to increase by 0.6-2.5°C over the next 50 years with significant spatial variation (IPCC, 2001). While this will permit cultivation of crops in areas of the world which are currently too cold (e.g. Siberia and northern America) and extend the potential growing season for others, it will also threaten the viability of crops in many of the major areas of production. Simulation models suggest that wheat yields in south-east Australia may decrease by about 29% (Anwar et al., 2007) and direct studies in the Philippines have shown that irrigated rice yields decrease by 10% for each 1°C increase in the minimum night-time temperature although the maximum temperature has no effect (Peng et al, 2004). Higher temperatures will shorten the life cycle of most crops, by accelerating development and hastening senescence, thereby decreasing the time available to harvest light and produce biomass. The effects on phenology vary both between species and with environment (e.g. David et al., 1997; Remy et al., 2003; Asseng et al., 2004). Perennial crops may respond more strongly to an increased temperature than annual crops (Estrella et al., 2007). Other effects such as drought or an increase in ozone concentrations can exacerbate these effects (Porter, 2005). The decreased time available to harvest light and produce biomass contributes to yield reductions at elevated temperatures (Estrella et al., 2007). Higher temperatures increase both dark and photorespiration. The increase in photorespiration at elevated temperatures results both from a decreased ability of Rubisco to discriminate CO2 from O2 as its gaseous substrate and an increase in the solubility of O2 relative to CO2 (Parry et al., 2003a). In addition, more frequent, severe and erratic fluctuations including periods of extreme temperatures (both high and low) are predicted. Unlike the effect of CO2 the yield response to temperature may be discontinuous (Cassman, 2007) and dramatic yield decreases can occur as a consequence of small changes in temperature. For example if critical temperatures are exceeded during the flowering phase, pollination fails in the major C3 cereal crops, decreasing seed production and thus yield. The critical temperature is 30°C for wheat (Saini and Aspinall, 1982) and 34°C for rice (Matsui et al., 1997). Fortunately, there is evidence for some genetic diversity in this trait that could be exploited to mitigate the effects of global warming. Higher temperatures increase water loss from both soil and crops thereby increasing abiotic stress. Conversely, a key expectation of climate change projections is that elevated CO2 may decrease stomatal conductance and thus help mitigate evapotransporative losses from crops. However, water availability is already a major determinant of yield. Even in high-yield environments like the UK the limited availability of water already decreases wheat yields by 1-2 t/ha (Foulkes et al., 2002). Much larger decreases in yield and even crop failures are occurring and are anticipated for regions where water availability is already a major limitation on production. 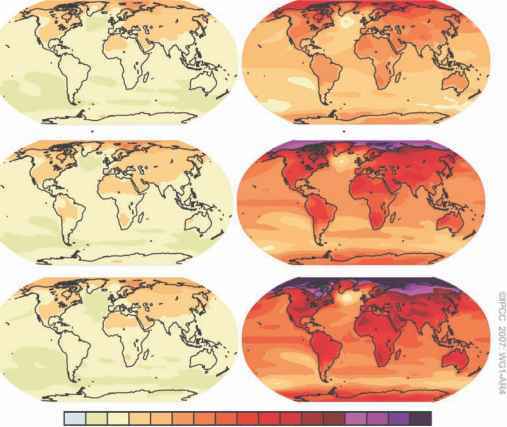 Discussion on adaptation to drought and heat per se can be found in Reynolds et al. (Chapter 5, this volume). However, even in those areas in which rainfall is predicted to increase, yields may be decreased by an increase in pests and diseases (see Legreve and Duveiller, Chapter 4, this volume). Controlling such pests and diseases will require more energy inputs and thereby contribute further to climate change.